Does the Left Have a Patriotism Problem? 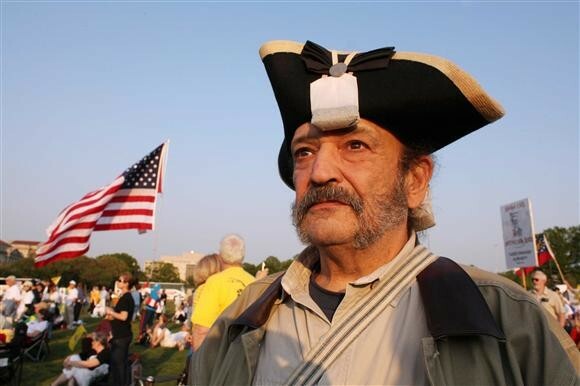 It’s almost accepted as a truism that people on the right in the US are more patriotic–or, at least, more comfortable with expressing patriotic sentiment–than people on the left. This is not too controversial a notion on left or right, though you will certainly find many in the Democratic Party full-throatedly denying that it’s based on fact. Liberal Democrats, they say, can get just as teary-eyed over “The Star Spangled Banner” as the most politically constipated Bircher. You will also hear among a certain kind of Democrat the sort of argument you hear among liberal Christians comparing themselves to fundamentalists, about the ersatz nature of right-wing patriotism compared to “real” liberal patriotism. But I think most people would agree that those on the right are far more comfortable wrapping themselves in the flag than those on the left. To test that, ask yourself how you think the fellow in the photo below would feel about corporate tax rates, government regulation of companies’ CO2 emissions, federal investment in renewable energy sources or subsidization of early childhood education in the barrios of our Southwestern cities.